The Critical Occupations List (COL) is a set of occupations in demand that identifies the skills imbalance across 18 economic sectors in Malaysia. It aims to be the primary instrument to promote better coordination of human capital policies aimed at attracting, nurturing and retaining talent. Because the COL is developed with the data from employers, it provides a big picture of the skills and occupations that are in demand within the industries. It also gives you a better idea of the occupations that will be prioritised by policymakers, especially in the aspects of immigration, education and upskilling opportunities. 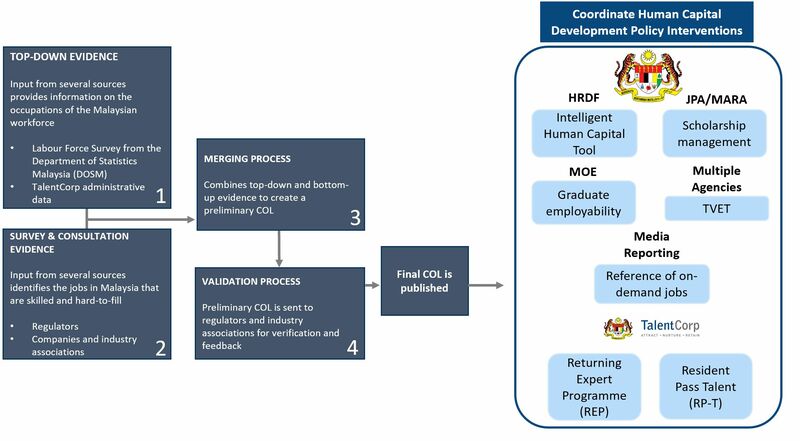 COL will continue to expand to create a comprehensive map of Malaysia’s most demanded current and future skills and talent towards Industrial Revolution (IR) 4.0. Download the COL 2018/2019 full list. Download the COL 2018/2019 report. Download the COL 2017/2018 report. Download the COL 2017/2018 full list. Download the COL 2016/2017 report. Download the COL 2016/2017 full list. Download the COL 2015/2016 full list. An official channel to identify the skills and jobs most in demand, specific areas of talent needs and issues. A platform for identifying future occupations arising from the impact of disruptive innovative technologies. Encourage employers to invest further in developing sought-after skills. Enhance coordination of human capital development policies. Want to be part of COL? Contact us. What is the COL used for? TalentCorp’s Returning Expert Programme (REP) and Residence Pass-Talent (RP-T) incorporates the COL as one of the key approval criteria for applications. The Ministry of Higher Education (MOHE) uses the COL as a reference to review new programmes as proposed by public institutions of higher education. It has also been used as a reference on online platforms, including (but not limited to) JobStreet Malaysia, StudyMalaysia.com, LinkedIn, EduAdvisor, The Edge Malaysia and Leaderonomics. How often is the COL updated? The COL is updated once every year. The COL 2017/2018 list was released on 6th February 2018. The COL 2018/2019 list will be available in December 2018. How are the occupations classified in the COL and what are the occupations that the COL covers? The occupations are classified based on the Malaysia Standard Classification of Occupations (MASCO). MASCO is a national standard for classifying occupations in Malaysia, which was developed based on the International Standard Classification of Occupations (ISCO). Why doesn’t the COL provide specific numbers, e.g. how many engineers will we need in the next five years? Based on the experiences of advanced economies, attempts to predict the exact demand of occupations are likely to be inaccurate, because they are based on many assumptions. The COL aims to suggest which occupations will have a labour shortage, and not on the extent of the shortage. Example: while many oil and gas firms forecast a large need for skilled workers in the upstream sector, the unexpected fall in oil prices and uncertain timing of its persistence have led companies to freeze hiring; some have even retrenched workers. Forecasts such as “we need 30,000 engineers by 2020” might be inaccurate and result in an oversupply of labour (leading to problems such as graduate unemployment). Countries such as the UK, Australia, and Canada have also adopted a similar approach. Why doesn’t the COL rank occupations by how critical they are (in terms of the acuteness of shortages/criticalness)? The COL suggests which occupations appears to be in demand and are strategic to the Malaysian economy. While the COL indicates which occupations received more evidence, it does not compare how critical each occupation in relation to one another. The decision on the criticalness of each occupation is subjective to the users of the COL.
How do companies benefit from the COL? Companies can give input to the COL via the Call for Evidence (CFE) survey, to share their key talent needs and hiring challenges. Based on the COL, TalentCorp can drive for meaningful interventions that are reflective of industry’s talent needs. The COL can be used as a reference to guide relevant programmes. For example, TalentCorp’s REP and RP-T gives more consideration for applicants working in a critical occupation. This benefits companies who hire talents through TalentCorp’s initiatives. How does the COL benefit talent? Directly: Companies, industry associations/regulators, policy makers and the general public can use the COL as a reference to understand the trends of different occupations in Malaysia. Indirectly: The COL is used as a reference to ensure that human capital related initiatives/policies will better target industry talent needs. For example, new courses introduced at universities will go through a committee panel that uses the COL to assess whether the courses will lead to positive employment outcomes for university graduates. Does the COL take into account issues of the global economy, current government interventions, and other issues like government mega projects (e.g. : Malaysia High Speed Rail, East Coast Rail)? Yes. The COL draws data from national surveys and companies feedback. Any issue that influences employers’ hiring policies will therefore also be reflected in the COL results. Such issues include (but not limited to) the general state of economy in the industry, government regulations, and national development plans. Does the COL also cover future jobs in demand? The COL provides information on the skills that employers need in future. In the CFE survey, employers are asked whether they plan to introduce new production techniques in future, and if they expect to expand their workforce in specific occupations. Bottom-up evidence on future labour shortage is used together with top-down evidence to decide if an occupation should be included in the COL, and also to identify emerging trends in future skills needed in the economy. However, the COL does not differentiate between short-term need and long-term need for occupations – this is why the COL is updated every year, to provide constant updates. What will the COL focus on in the future? In 2018, the Critical Skills Monitoring Committee (CSC), led by the Institute of Labour Market Information and Analysis (ILMIA) and TalentCorp, will also provide information on the policies that are most sensible for any given COL occupation (e.g. migration, TVET, etc. ), and how each occupation will be affected by digitisation, automation, and Industry 4.0. This profiling will be supported by real-time labour market information on skills, in order to provide an updated picture on vacancies, the supply of and demand for skills, and insight into the knowledge and skills that are in demand.